Jeremy and I love dining out in Boulder because there are so many great restaurants in town. But we can get restaurant burnout just like we do when we’re on travel. We cherish our home-cooked meals and quiet conversations together (and with Kaweah). Having visitors up to our mountain home isn’t terribly convenient though, so we usually meet in Boulder. It makes sense. My aunt (Mom’s youngest sister) and uncle were in town at the end of last week which meant dinner with everyone Thursday and lunch the next day. Then Jeremy and I came to Boulder Saturday for dinner with my folks because they went home to Virginia Sunday morning. I used to feel that going out for dinner was an indulgence. With my parents spending summers in Boulder, we are always meeting up for meals – it’s the Chinese way. I’ve learned to pace myself and nibble at shared plates because even though eating together is so important, I think spending the time together is the most important. I have always bonded with my parents over food. In the last couple of years, they have begun making “special” Chinese dishes that I never had growing up. Maybe it’s their desire to pass along some of their culture and heritage to their daughter who is more American than Chinese. Maybe it’s my increased interest in cooking. 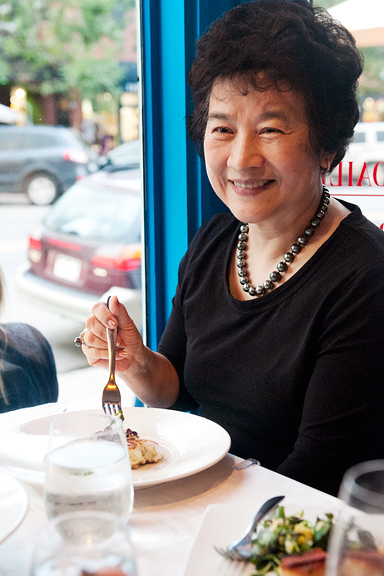 In turn, I share with them the foods that I’ve discovered and come to love. I think they enjoy it. 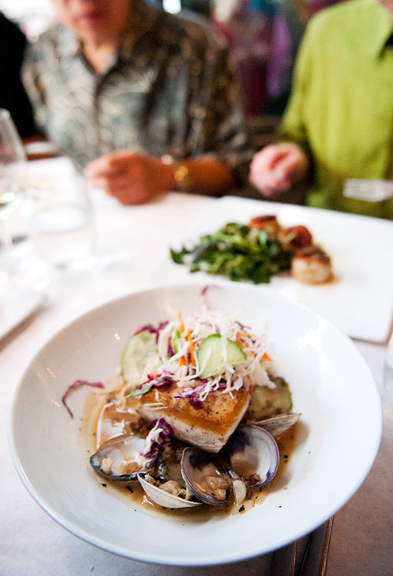 Food and family time are so intricately intertwined. When I saw my parents off at the bus station early Sunday morning, I felt that tiny pang in my heart. One of the reasons my summers are so busy is that I really try to make sure my parents have a good time while they are in Boulder. It’s partly that Good Chinese Daughter thing, partly because they’ve worked so hard all their lives, partly because they’ve been denied the joys of spending their retired years with Kris. I just want them to be happy. This is what we want most for those we love. Saturday evening, I handed my folks some coffee cake I had made. It was for their breakfast on Sunday before their flight home. I remember when I would wake up at puke-thirty in the morning to fly back to college and Mom would be up making breakfast and packing a lunch for me. It’s funny how we become our parents. And by funny I mean ha ha, I mean ridiculous, I mean crazy, I mean strange, but most of all, I mean awesome. 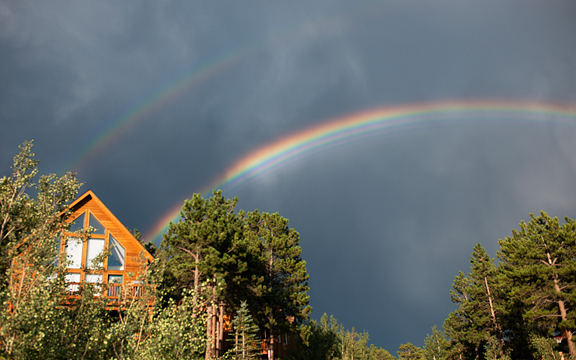 Speaking of awesome – we’ve had awesome rainbow action lately. So that coffee cake I gave my parents? That was some delightful coffee cake. I’m pretty meh about eating cakes, but add fruit and you’ve changed the whole equation. Right now, I’m obsessing over peaches – luscious, gorgeous, juicy, Palisade (Colorado) peaches. Toss in some blackberries and you’ve got a showstopper. Half of the food I’ve been preparing of late is intended for winter (and by winter, I mean fall, winter, and spring). I’m canning tomatoes, jamming peaches, roasting green chiles, freezing sweet corn… There’s something to be said for enjoying your favorite foods in your (my) favorite season (winter). But you can’t squirrel it all away! Some of it needs, nay DEMANDS, to be eaten now. Our Colorado peaches are at their peak. I was 30 minutes late getting to the Boulder Farmers Market last Wednesday and they were cleaned out of seconds. After kicking myself, I went ahead and bought a small bag of three giant peaches. Perfection. 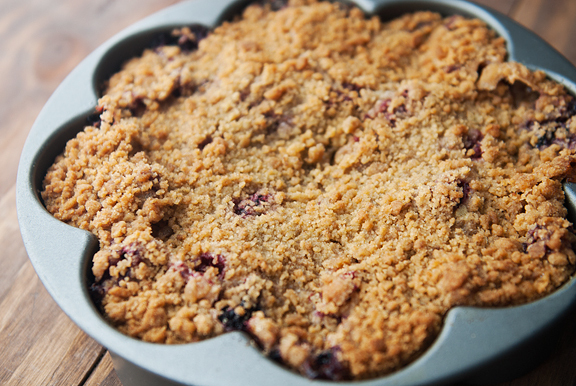 Grab a pint of blackberries (you only need a cup, but the other half is for you to snack on) and the coffee cake practically makes itself. 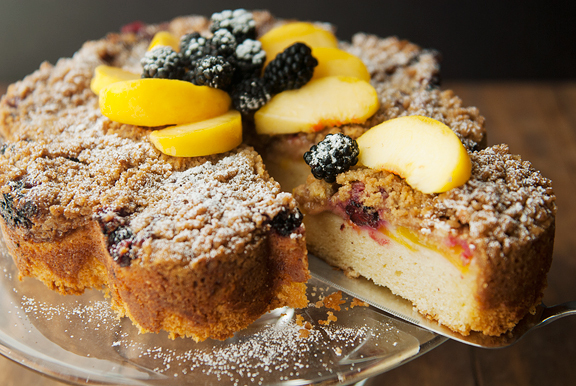 It’s got three parts: the cake batter (easy), fruit (easy), and streusel (easy). Layer them in a pan with a removable bottom and bake. Simple. The cake needs to bake for 70 to 80 minutes, so don’t think you can get away with 65 minutes or less. It remains quite moist and tender as long as you don’t overbake it. But if you underbake the cake, the center will be gooey and it may crater a bit. Let it cool before removing it from the pan. 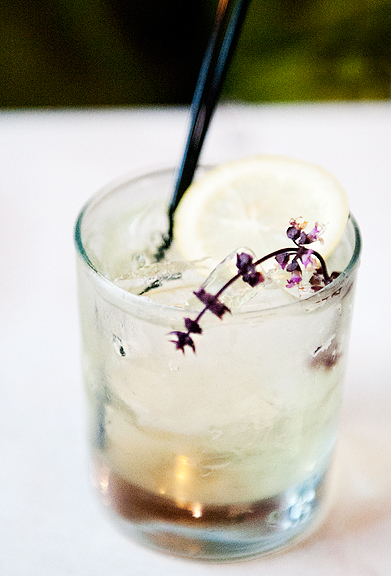 Garnish as you like. I personally feel that you can never have too much fruit, so pile it on (and it’s good for you). A little dusting of powdered sugar isn’t necessary for sweetness (the cake is sweet enough without the additional sugar), but it looks pretty. 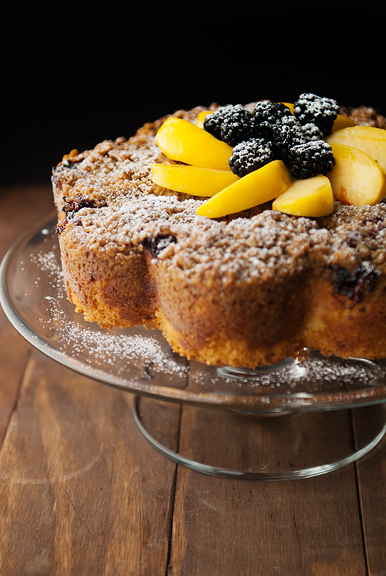 The fresh fruit, the baked fruit, the sweet, crunchy streusel, the soft crumb of the cake – a great combination for parties, afternoon tea, a coffee date, breakfast, or dessert. Do this now while the peaches are still in season and share with someone you love. P.S. Jeremy, the guy who doesn’t like peaches, likes this cake. That’s right. 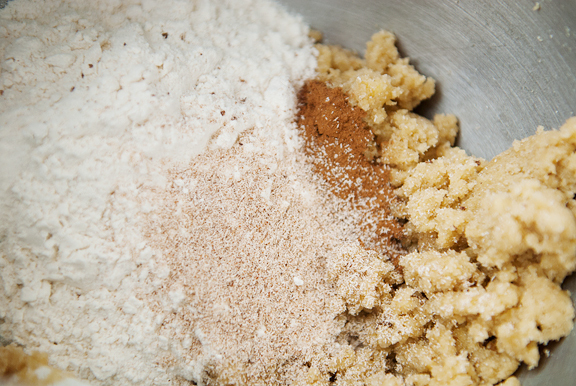 Make the streusel: Beat the butter and sugars together until fluffy. Add the flour, cinnamon, and nutmeg to the butter and sugars. Beat until just combined. Set aside. Make the cake: Preheat oven to 350°F. Grease a 9-inch springform pan. 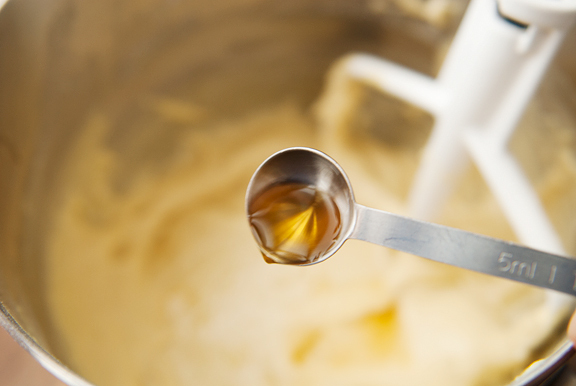 Beat the butter in a mixing bowl until smooth. 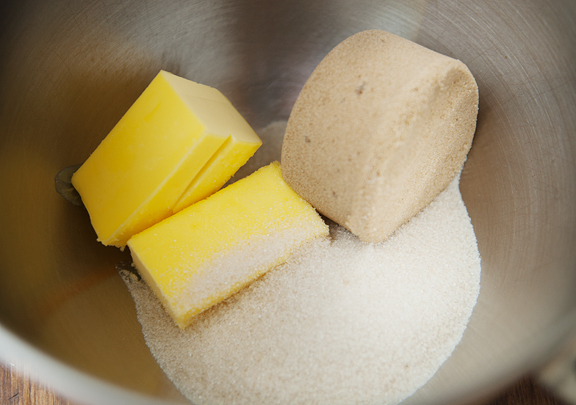 Gradually add the sugar to the butter and beat until fluffy. Add eggs one at a time, beating well after each addition until completely incorporated. 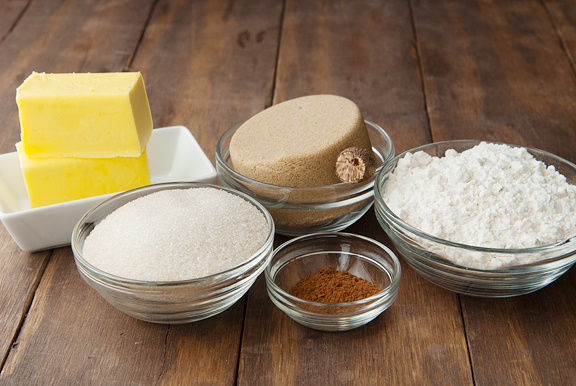 Combine the flour, baking powder, and salt in a bowl and mix well. 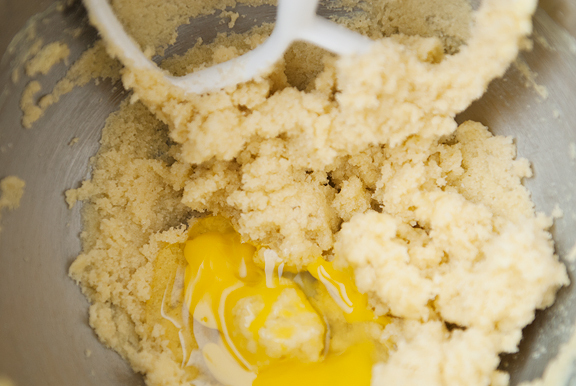 Add a third of the flour mixture to the batter and mix until combined. 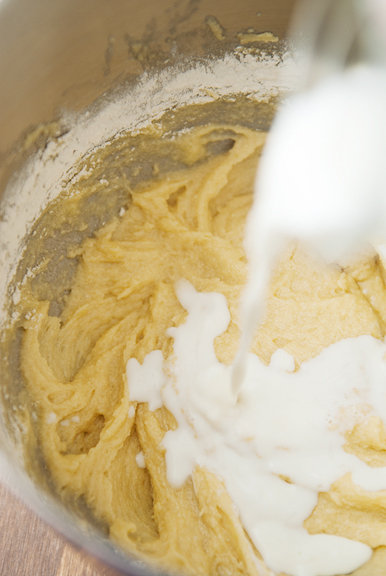 Add half of the milk to the batter and mix until combined. Repeat until you end on the last third of the flour mixture. Stir in the vanilla extract. Pour the batter into the prepared pan. 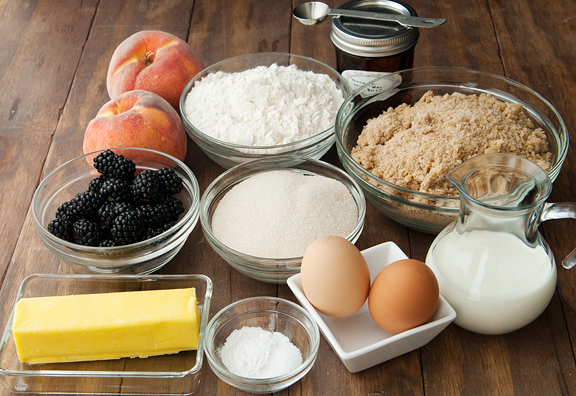 Layer the peaches and blackberries on top of the batter. 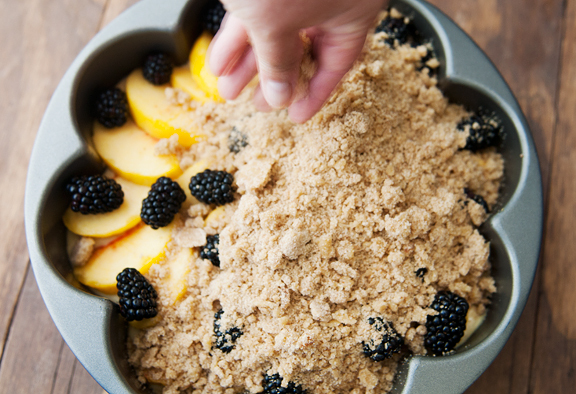 Sprinkle the streusel over the fruit. Bake for 70-80 minutes or until the center of the cake is set (not wobbly). Remove from oven and let cake cool completely before removing from pan. 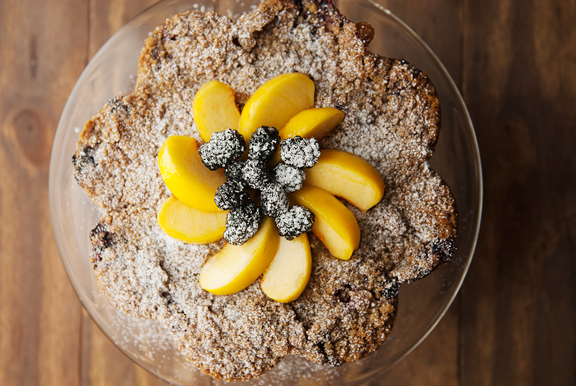 Garnish with fresh fruit and powdered sugar. Serves 8-10. Oh how I miss palisade peaches. 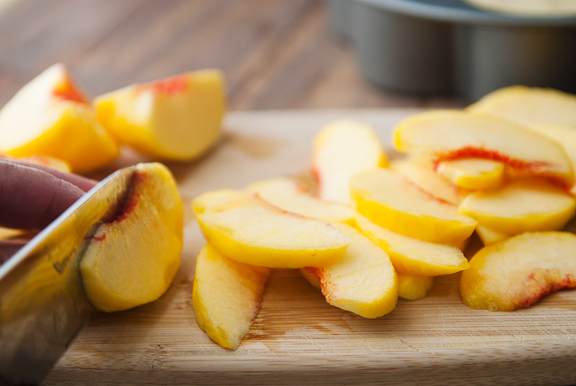 I would do just about anything for some ripe delicious juice-running-down-my-chin Colorado peaches. All of the peaches I have found in Belgium are super disappointing in comparison. Whoa, you’ve almost tempted me by saying that Jeremy likes it, but my husband loathes peaches. If you added walnuts & then served it to him with coffee, you’d have a perfect storm. Sad as I love peaches & coffee. Beautiful coffee cake (that I can make for friends), beautiful rainbows, and sweet words about your parents. I love this cake pan! It’s such a pretty cake. I envy the way you feel about your mother. It’s lovely. I love the pan that you are using, so cute! The coffee cake looks awesome! Your post made me get a bit teary. Such a good daughter you are. 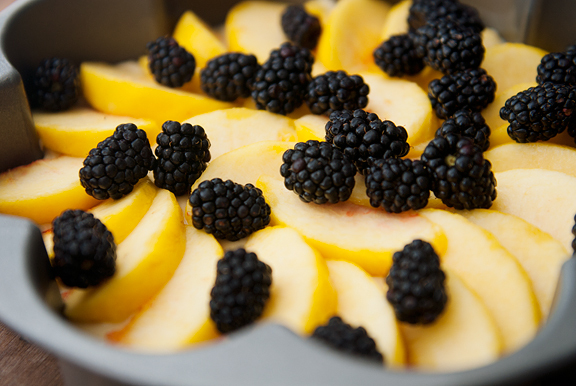 I was just gifted a case of amazing peaches, combined with my stash of wild blackberries, yeah, will be doing this recipe in the morning, right after the kiddos get on the bus! And now, I’m going to give my Mom a call, just because. Thanks. This cake is gorgeous, and surprisingly simple! Looks awesome! I often want to move out of Singapore for the lack of decent produce. We came back from Istanbul last week and with us, I brought back a bag of peaches. So good! Gonna make this with or without some subpar fruits. Looks too good to miss! Did you have trouble turning the cake out? The pan you used is not with a removable base, is it? Beautiful words! Beautiful cake! 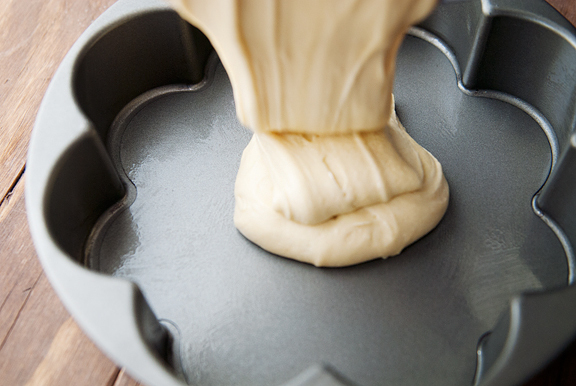 Would love to know what pan that is, such a lovely shape and perfect for your cake!! cake: beautiful; your pix: beautiful; your life: beautiful; your home: beautiful…but, your mother is ravishingly beautiful! i love the blogs in which you include at least 1 pic of her. she is charming, graceful, elegant, refined, lovely & again, yes, beautiful! i have perhaps missed her name from past blogs…may i please know just her first name? i would love to know both her chinese name as well as her american name. god bless all of you, including our sweet kaweah. Last spring, with the crazy late snow (great for skiers, bad for fruit trees) I was so worried that the Palisade peaches would be puny and that would be heartbreaking. Alas, I shouldn’t have fretted, as this years crop is delicious. Every time I cut into one I have a sense memory of my late husband. He lived for the six weeks of fresh from the farm peaches. He would call from the airport (he traveled for work-alot) and his first question was always, “Did you get some peaches?” I like to think that in Heaven it is always Peach Season! 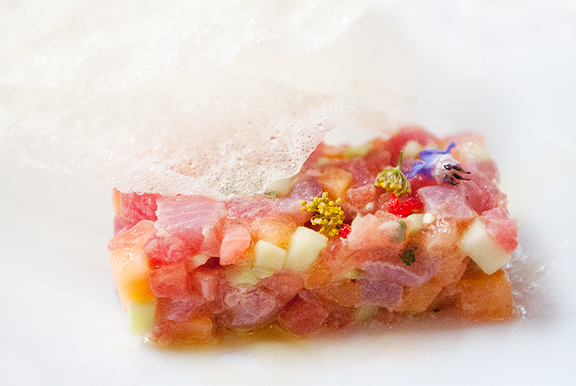 I received your email with this recipe like I do all the others and am in awe at your beautiful stories and great recipes. I have created only a few of your recipes and they have all turned out great. Seeing as I am not much of a baker, I read the recipe and filed it for later use. During a short jog in the trails behind out apartment I passed by the local farmers and realized that it was blackberry time and even better pick your own. I immediately thought of your recipe that I read this morning and thought that it was meant to be. I’m not a follow a recipe kind of girl so I improvised a little and added blackberries to the cake batter as well. Unfortunately my presentation was not as good as yours seeing as mine ended up upside down, but otherwise it came out perfect! My family was first in shock that I was baking then pleasantly surprised that this non-baker was able to pull off such a delicious cake. Thank you for sharing your stories and your recipes with us! Love butter and love coffee cake. What a beautiful presentation! Your story brought tears to my eyes. My mom was bedridden (from diabetes) for many years and later passed away. Except for Thanksgiving dinners, she never did have the opportunity to enjoy my everyday cooking. I live with that guilt, but we lived in different cities, and I was busy with work and all. Fortunately, I’m very close with several aunts, and I share with them all the delicious cooking I learned whenever we get together. That coffee cake was beautiful. Nice pan choice. I wish my mom was around to pack a lunch for, or spoil. It’s been over 30 years. She died way too young. sounds yummy. i love the shape! Laurel – yes, there’s nothing quite like a Palisade peach! Megan – thanks, I can’t remember where I got it, but it’s a non-stick, so I don’t really like the coating on the pan itself (because it is starting to peel). I wish I could find one in a non-coated form! Mrs. Ergül – mmmm, Istanbul! I’ll bet that was an awesome trip. I think with baking, you can use “subpar” fruit and it will still turn out nicely. The pan has a removable base, so it’s quite easy to remove (just have to make sure the sides have loosened. Suzi – I can’t remember what brand it is or where I bought it, but I can’t seem to find it on Google either :\ Sorry! It’s been at least 20 years.